This is the category for Khyber Pakhtunkhwa, a province of Pakistan. 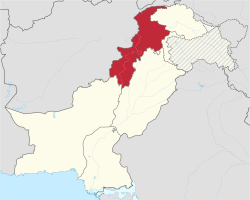 The official name of the province was the North-West Frontier Province from 1901 to 2010. The neighbouring Federally Administered Tribal Areas were merged into the province on May 31, 2018. This page was last edited on 1 June 2018, at 16:22.